Are you searching for a quality, experienced taxidermist that will treat your trophy as an artistic creation? Call Randy Strohl at Strohl's Taxidermy located in the Lehigh Valley, Pa.
Strohl's Taxidermy specializes in North American game, African game, exotics and birds. 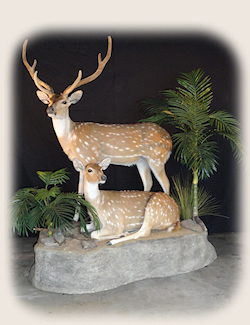 The taxidermists at Strohl's create custom mounts and bases and offer a competitive 8 to 10-month turnaround time. By using the most modern tanning methods and top-quality supplies, your trophy will come to you looking pristine with a lifetime guarantee. The owner of Strohl's Taxidermy, Randy Strohl, has 10+ years experience in the field. Prior to opening Strohl's in 2006, he apprenticed under two of the Lehigh Valley's best taxidermists. Randy learned unique work with attention to detail would set Strohl's Taxidermy apart from the rest. Strohl's Taxidermy offers a variety of other services including trophy crating and shipping, trophy room cleaning and trophy room design. Call today and make an appointment with experienced taxidermists at Strohl's Taxidermy – open every week day and weekends by appointment. When you choose Strohl's Taxidermy in Walnutport, "Detail is Everything! Now Booking Agent for Okeechobee Outfitters (formally Brady Ranch). Call for details!